After the debacle that was Madden NFL on the 3DS, just one look at this title most likely has people assuming the worst for the venerable football franchise's first effort on the Vita. Thankfully, these fears mostly prove to be needless, though there are still a few hiccups that prevent it from being a perfect version. 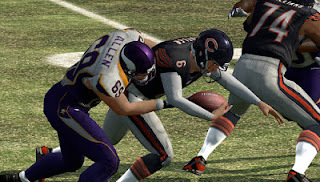 For starters, Madden NFL 13 has menus that feel as slow at times as early CD games. Given the amount of menu navigation involved in modes such as career, this can become quite an annoyance. That aside, once you get right down to actually playing football, things are much better. The action is smooth, the graphics are decent, and the only real negative is the lack of the new physics engine that console version received. There are some additional touch screen and motion controls that have been added in, but those are a relatively minor annoyance. I did experience a crash while loading into one match, so saving often is recommended in season and similar modes. In addition to regular exhibition and season modes, the Vita version of Madden NFL 13 appears to have all the modes of its console siblings, though the franchise mode is offline only. Online seems to be head-to-head only, but it's there for those who want multiplayer on the go. It may seem odd to be content with a version that is inferior to its console counterparts, but there hasn't been another football game on a portable that is quite this good. It seems more in line with last year's release (including not even updating stats from 2012), but for the right price many will have an absolute blast with this. It's good to see EA do a decent job here after the debacle that was Madden 3DS. 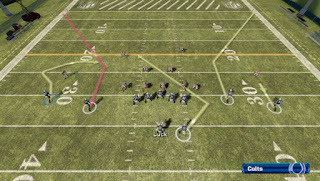 If you're a football fan or need to find a gift for someone who is, this is the best portable NFL game out there. Disclosure: A retail version was provided by EA Sports.